TAG. We’re It! 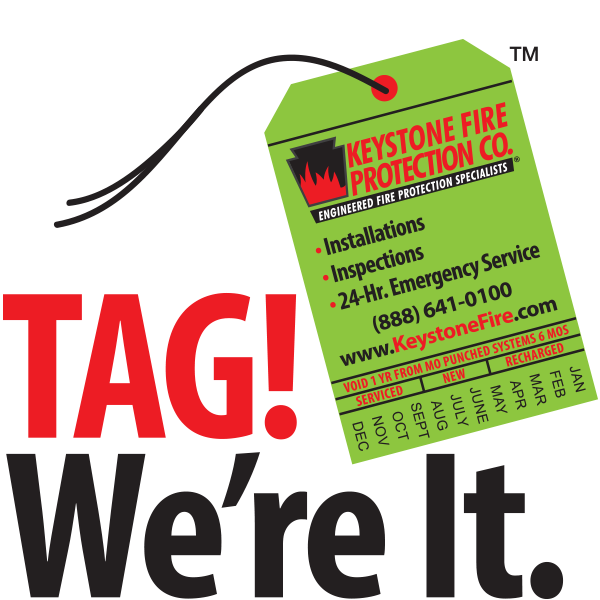 – Keystone Fire Protection Co.
With Parts Protection Plus™, Keystone will repair or replace any malfunctioning control panel, field power supply, remote annunciator, graphic annunciator, digital communicator, and/or field peripheral device with a component of like kind and quality as the original. System impairments and deficiencies inhibit the proper operation of your life-safety equipment and can delay your system from being certified to applicable codes and standards. Under the Rapid Repair™ program, we correct selected impairments during an inspection for the just the cost of the parts alone—NO additional charge for labor. Rapid Repair program includes most battery, gauge, and flexible hose replacements, missing protective caps and informational signage. Compliance with codes and standards can be challenging, particularly as your inventory of fire protection equipment increases. To ease this burden, Keystone offers ePLACE™ Field Device Placement Reporting, which details the location and pertinent service data for your life safety equipment. The report flags life safety equipment due for testing and maintenance, as well as their location within your facility. ePLACE™ helps manage your life safety assets and budget for anticipated maintenance costs in future years. This all-inclusive, extended-service plan assists customers desiring fixed-budget extinguisher maintenance costs, while maintaining a high level of fire protection. xTEND-GUISHER™ includes the cost of the annual inspection, all recharges at the time of inspection, 6-year maintenances, hydrostatic testing, parts and labor. Also included, at no additional charge, is extinguisher mounting, extinguisher loaner service, and ePLACE™ Field Extinguisher Placement Reporting, detailing the location and pertinent service data for each unit. Kitchen fire suppression systems include one or more nozzles, each with a protective cap or seal to prevent grease buildup. This buildup can impede or prevent the flow of agent in a fire. During cooking, nozzles are exposed to greasy vapor and high heat, which can cause premature failure of the seal. Both these situations are dangerous system impairments and can result in a costly repair. A single nozzle purchased new can cost upwards of $40 each excluding labor to replace it; seals and caps range from $10 to $15 each. With NOZZLE PLAN PLUS™, Keystone will provide full maintenance on your nozzles at the time of inspection(s), including the cleaning, repair or replacement of all nozzles, protective caps and seals and all labor charges for one flat fee per year — no hidden costs, no surprises. Control the costs of maintaining your fire protection systems. Know your life safety systems and equipment will operate when needed.